or via the install package application. It give very good compression ratios, in general better than gzip. Decompression is very fast, so you can compress all your executable on your Zaurus to economize your precious RAM...!! UCLX compressed file , are first decompressed in /tmp/ directory, then the temporary file is deleted while it is executed.. It proceed exactly like UPX do for decompressing executable on Linux, this way has been proven to be stable, well working. A port of Scummvm last official version v0.4.1 to the Zaurus. Install the .ipk package, then create whith a text editor, a configuration file named: .scummvmrc in your home directory, /home/root/ on the Zaurus. Set your savepath as you want, I use /mnt/cf/scummvm for example to put savegames on compactflash. 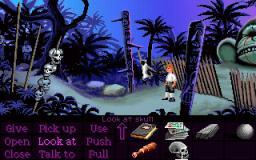 Here is the patch against ScummVM v0.4.1 sourcecode, to make it compile and work on Zaurus. then edit Makefile, to change the path of your gcc cross-compiler, if it is needed..
15/3/2004: version 0.9 of XU4 ipk package released..
XU4 is a port of Ultima 4 on linux. It is a work in progress, but start to be quite playable actually..
With the last XU4 version (0.9), the game is now finishable.. The game have been improve a lot , and many new options have been added , to make the game easier to play. You can access these options, under the Configure menu, in game title page. 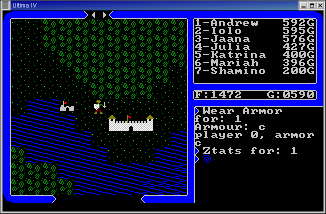 The .ipk package contains all you need to play it on Zaurus, I have included the original Ultima 4 files, because they are needed to play..
Well , I am 29 years old, and people of my age must remember this goold old game NEBULUS. It was a platform game, very addicting, of the time of the C64 & Amstrad CPC. Use Cancel key to exit the game..